High End Audio Industry Updates: How to Set up HEOS App with an iOS device? How to Set up HEOS App with an iOS device? A friend of mine got HEOS 3 wireless speaker as the New Year gift. He was quite happy as it was a surprise gift to him and above all music is his passion as he is a die-hard music lover. He could not get the time to call someone for installation of this HEOS wireless speaker system so tried doing the same from reading the instructions from the owner’s manual. I thought to offer him some help. 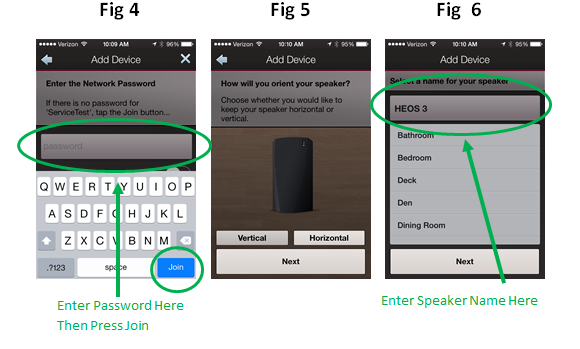 So while helping him out in the installation process I jolted down some points from the owner’s manual on how to connect HEOS wireless speaker to an iOS device. As per the recent news source the launch of HEOS wireless speakers has created a recent buzz in audio world. Moreover it’s giving a direct competition to the Sonos systems. Keeping in view the growing demands of its users; HEOS music streaming app is developed to be flexible with multiple operating systems such as Apple's iOS and Android. Its download operation is quite easy for those who want to enjoy music at their HEOS system. Let us now discuss here how to connect to your HEOS system using HEOS app. First and foremost step would be to connect your iOS device to your wireless network. Check the device's Settings and make sure the wireless option is enabled. 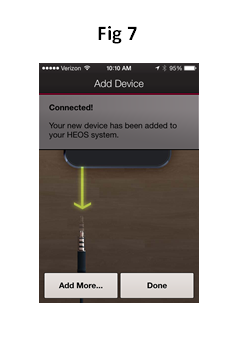 Once the device is connected to the wireless network you can download free HEOS App from the Apple App Store. In the Apple App Store's Search engine; type the HEOS App which can bring it up the right way and then install it to start the download operation. Once the App download is done, select ‘Open’ to make the setup process start right away. If the HEOS App is available you can then unpack the HEOS system and connect it to the power source. The App then asks you to make the software download update available. It is always better to go ahead with the updates as this way you can avoid any minor problems. The software update helps to make the sound quality of the system better to keep everything up to the date. After this the next thing would be to ‘Add Device’ by using the App. It can be accessed from App’s main page which is at the top left of App screen. 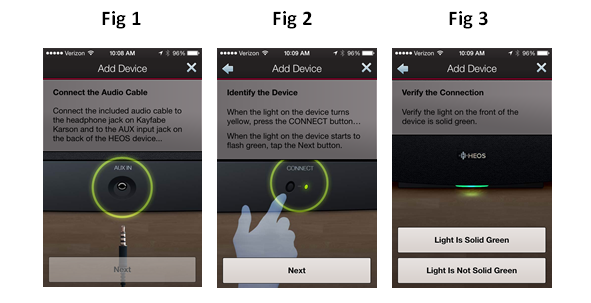 Check in the first setup screen (Fig which shows where to make the connection. One end can be connected to the headphone jack of your iOS device and other one is connected to the rear side of HEOS device marked as "AUX IN." Later press "Connect" button LED flashes green for few seconds and then turns to solid green. You will be asked for the wireless encryption key or wireless password (Fig 4) later on. Hope the above set up directions help you to connect to your HEOS system very easily that too without any problem.